MSD Fuel Flexible Hose Mounting UNIVERSAL - Dezod Motorsports Inc - Home of the automotive performance enthusiast since 2002. Epoxy-In Pocket – Part# 2145 – Epoxy-In PocketThis Pocket can be held in place with a strong epoxy or welding and is used for flexible fuel rail systems only. 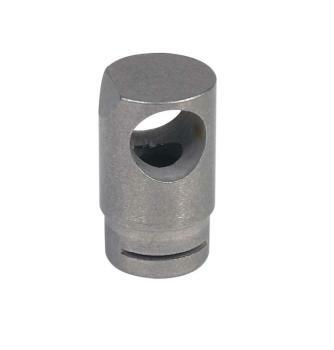 These Pockets are CNC-machined from aluminum for precision and have a ¾” OD. Internally, the Pockets are contoured to accept the form and bottom sealing O-ring of an MSD Competition Injector. An interior O-ring is also supplied to absorb heat and vibration to protect the injector. Epoxy-In Pocket – Part# 2120 – Epoxy-In PocketThis Pocket can be held in place with a strong epoxy or welding and is used for fixed fuel rail systems only. These Pockets are CNC-machined from aluminum for precise dimensions and have a ¾” OD. Internally, the Pockets are contoured to accept the form and bottom sealing O-ring of an MSD Competition Injector. 90° Fuel Delivery Top Mount – Part# 2135 – 90° Fuel Delivery Top MountThese Top Mounts are designed exclusively for Flexible Hose EFI systems. The brass mounts are CNC machined for accuracy within 0.001” and fit over the top O-ring of an MSD Competition Injector. An 1/8” NPT fuel hose fitting is required. Fuel Delivery Top Mount – Part# 2115 – Fuel Delivery Top MountThese fuel delivery mounts are CNC machined from #304 stainless steel for great durability and precise dimensions. They slide over ½” steel tubing (MSD PN 2205) then are brazed or TIG welded in place to form a fuel rail. Fuel is routed through a 5/16” hole aligned to the mount and the injector. The PN 2105 Fuel Rail Clip is required for assembly.